I have been wanting to make some french macarons for quite a while now, and today I finally got around to making some! I plan on making some for my sister's wedding and wanted to have a trial run before the big day. I think I will experiment more with some homemade fillings, but these that I made today were very simple and easy to make! I combined a couple recipes to create this one. The main recipe I followed was by Martha Stewart here. I love the muted colors of her macarons, however I decided to make mine a bit more colorful! Directions are listed at the bottom of post. Pulse the confectioners' sugar and almond flour in food processor until combined, then sift the mixture. Preheat oven to 375 degrees. Whisk egg whites with on medium speed until foamy. 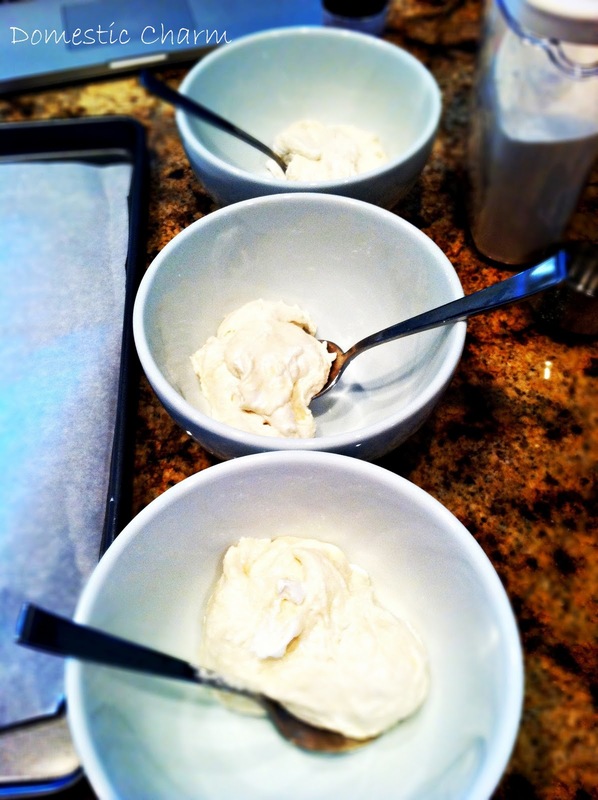 Add pinch of cream of tartar, and whisk until soft peaks form. Reduce the speed to low, and add fine sugar. Increase the speed to high, and whisk until stiff peaks form, about 8 minutes. 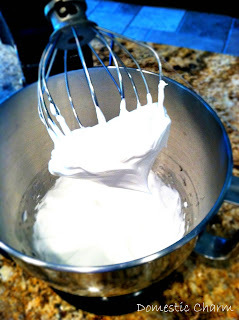 Sift flour mixture over egg whites, and fold until the mixture is smooth and shiny. Divide the batter to three bowls and add flavoring and food coloring. 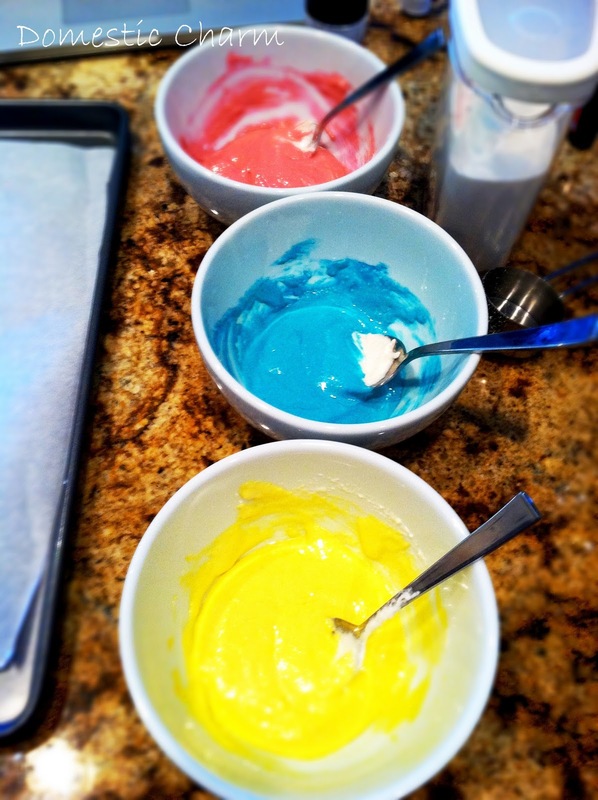 The lemon extract with the yellow food coloring, the vanilla extract with the teal food coloring, and the raspberry extract with the pink food coloring. 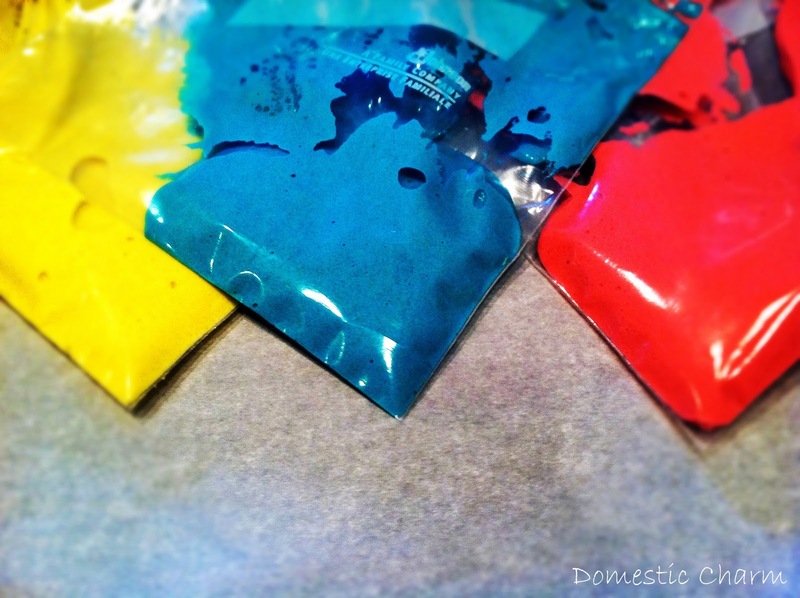 Mix until the colors are solid. Next fill pastry bags or ziploc bags with each color. You can use a 1/2-inch plain round tip to help pipe the 3/4-inch rounds, or you can cut the ziploc bags at the ends. Space the rounds about 1 inch apart on a parchment-lined baking sheet. Drag the pastry tip or the tip of the bag to the side of the rounds rather than forming peaks at the center. Tap the bottom of the baking sheet on the counter to release any trapped air. Let stand at room temperature for 15 minutes. Reduce oven temperature to 325 degrees. 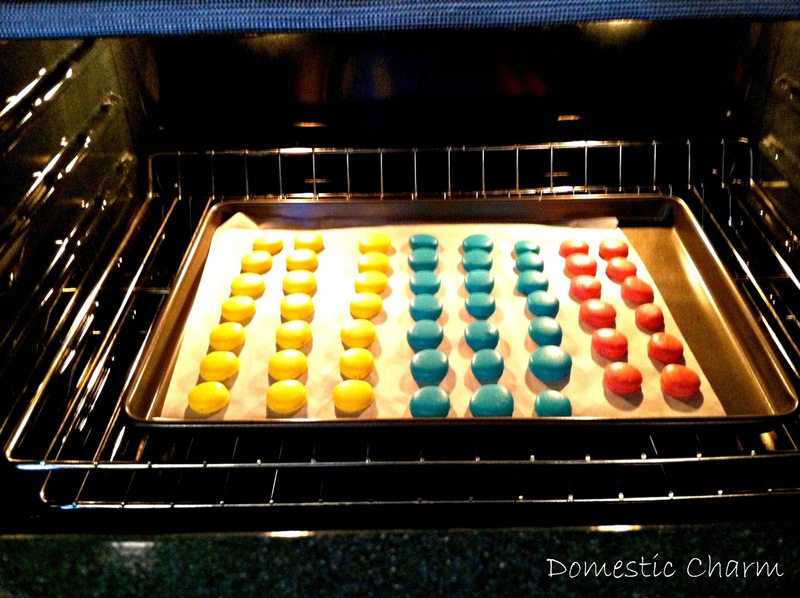 Bake 1 sheet at a time, rotating halfway through, until macarons are crisp and firm, about 6-10 minutes. Depends how your oven cooks, but you do not want to overcook or they will become hard and chewy. After each batch, increase oven temperature to 375 degrees, heat for 5 minutes, then reduce back down to 325 degrees. 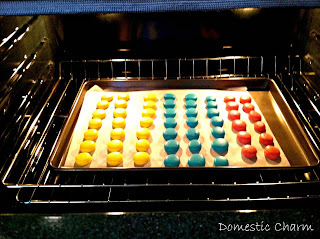 Let macarons cool on baking sheets for 2 to 3 minutes, then transfer to a wire rack. Sandwich 2 of the same-size macarons with 1 teaspoon of filling. Serve immediately or stack between layers of parchment, wrap in plastic, and freeze for up to 3 months. 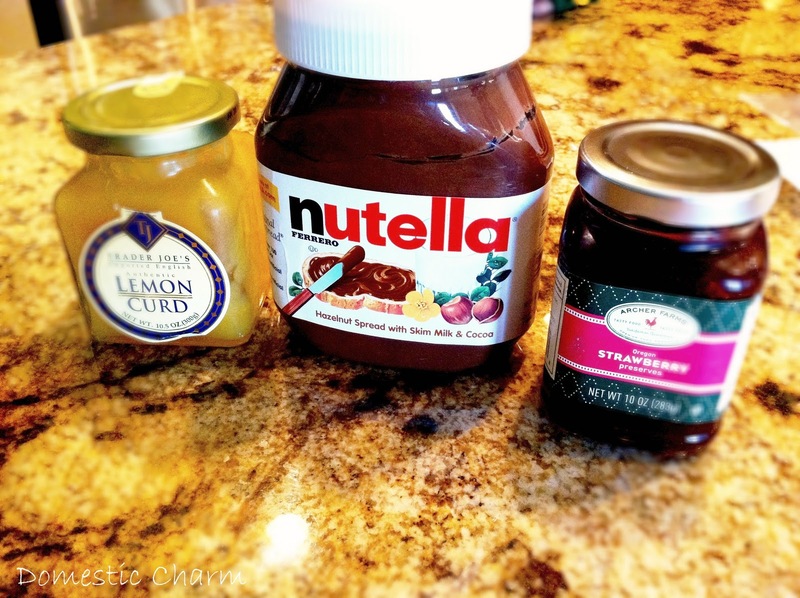 *Recipe slightly modified from Martha Stewart. These are gorgeous, Katelyn! You did an awesome job.. they look professional and SO delicious!! Can you make some for me!? 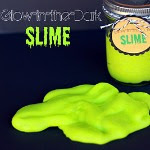 I'm SO nervous about making these.. are they relatively easy? Thanks Victoria! They really were easy to make. 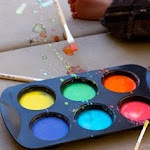 I was hesitant to make them too because I heard they can be tricky. I am excited to experiment with more flavors! wow! i've always heard how hard macarons are so i was scared to try. 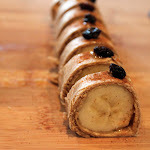 i'm definitely going to follow your lead and try this recipe soon! These are so pretty and really look professional! 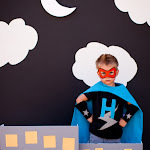 love that you went more bold with the colors! 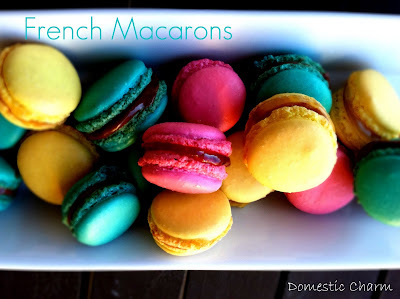 but easy macarons seems like an oxymoron for this baker as they are not the easiest for me! I miss making french macarons so much! 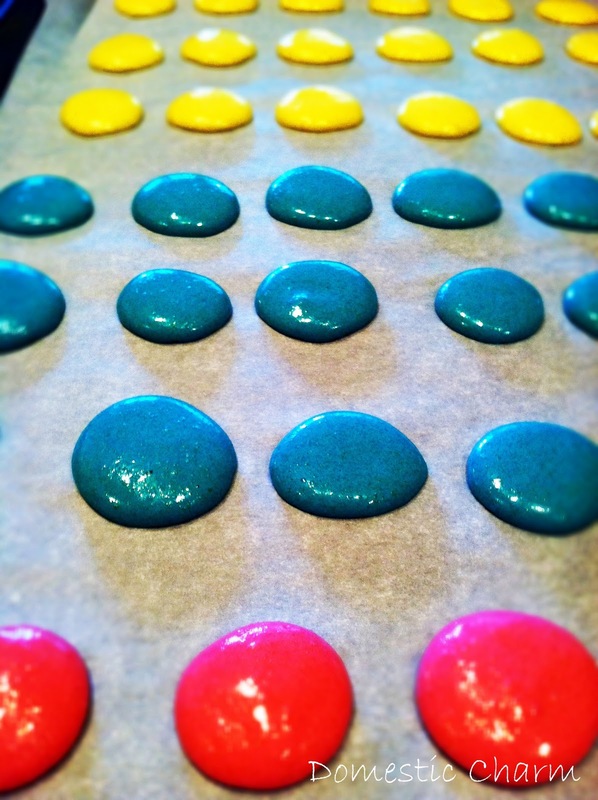 I don't have a nice, high-powered mixer down here (it's with Mom in Minnesota), so no macaron love for me. 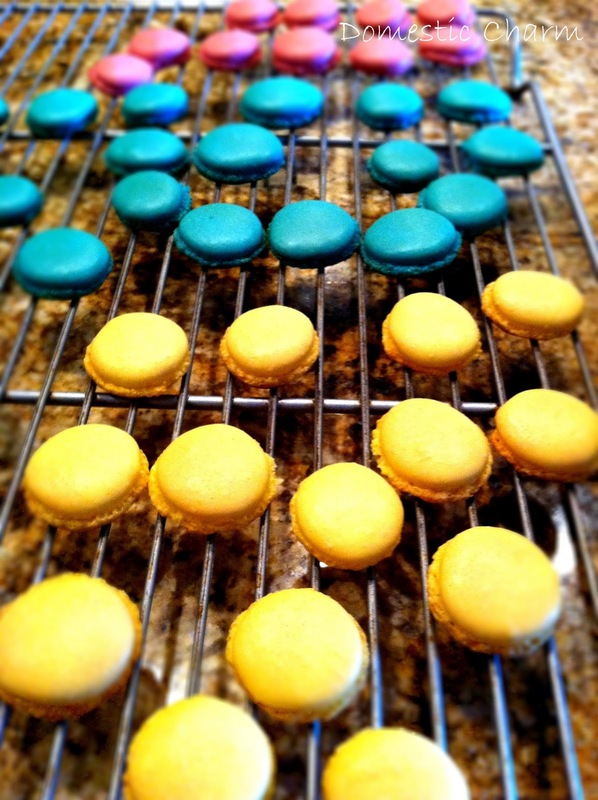 I made about 12 dozen macarons for my wedding back in 2009, and it was so much fun. These look AMAZING! Do you have a recipe for Pistachio Macarons?